Buddhist literature is having many forms and has been produced from different cultures wherever Buddhism flourished and still does. The most important ones are in the form of sutras which are the Buddha’s words or Buddhavachana, abhidharma concerned with analysis of phenomena, shastras or treatises. Initially it was passed down orally by monks. It was written down in different languages; mostly Indo-Aryan which were later translated. The earliest manuscripts have been found in the civilisation of Gandhara dating to the 1st century B.C, near Taxila ( now in Pakistan). The Pali canon known as the Pali tripitaka is the most important collection of Buddhavachana in Theravada Buddhism. It was preserved in Sri Lanka and was written down in the first century B.C; the Theravada textual tradition developed there. The Pali tripitaka which means three baskets which refer to vinaya, sutta and abhidhamma, The Vinaya Pitaka contains disciplinary rules for the Buddhist monasteries. The Sutta Pitaka contains words attributed to the Buddha. The Abhidhamma Pitaka contain expositions and commentaries on the Sutta. The Taisho Tripitaka is the Chinese Buddhist canon. In Tibet the Kangyur is the Buddhavachana. It belongs to various schools of Buddhism and contains sutras, vinaya and tantra. From the Kushana period in India, Sanskrit has been used to write the Buddhist texts. In Mahayana Buddhism, the sutras , based on the idea that the word of the Buddha has been transmitted by supernatural beings like the nagas, or revealed directly by bodhisattvas, were written in Sanskrit. which were later translated to Chinese and Tibetan canons. In the Mahayana school of Buddhism there also exist shastras or treatises which outline the sutras and expand on them. The works of important Buddhist philosophers like Nagarjuna, Vasubandhu and Dharmakirti are called shastras written in Sanskrit. The class of Buddhist texts called tantras developed in the seventh century. The tantras describe ritual practices and the use of mandalas,mudras etc. These are important texts in Vajrayana Buddhism dominant in Tibet. Vinaya texts are about monastic discipline. The Sutras are the discourses given by the Buddha or by his close disciples. Buddhavacana, the word of the Buddha. The sutras were delivered in forms like the sutra,prose discourses, geya,mixed prose and verse discourse, vyakarana,explanation, analysis, gatha,verse, udana, inspired speech, ityukta,beginning with ‘thus has the Bhagavan said’, jataka,story of previous life, abhutadharma, concerning wonders ,vailpulya,’those giving joy’,nidana,in which the teachings are set within their circumstances of origin,avadana, tales of exploits and upadesha,defined and considered instructions. Other well-known texts include the Dhammapada, a collection of sayings and aphorisms. the Udana, a collection of inspired sayings in verse, the Sutta Nipata, contains oldest of Buddhist practices,Theragatha, Therigatha; two collections of biographical verse related to the disciples of the Buddha and Jataka or birth stories, which recount former lives of the Buddha are part of the Pali Khuddka Nikaya. The prajna texts deal with wisdom or insight, which refer to the ability to see reality as it is. The Diamond sutra, the heart sutra are prajna texts. Other important sutras are the Lotus sutra, the Amitabha sutra, the Golden Light sutra, the samadhi sutras, kandavyuha sutra, Mahaparinibbana sutra among others. Illustrated manuscript of the Lotus Sutra, 14th century,Goryeo dynasty (918–1392), Korea,Metropolitan Museum of Art,USA. Preface to the Lotus Sutra decorated with Buddhas,9th century, Japan. Manuscript fragment , Buddhist Jatakamala, Sanskrit language in Gilgit-Bamiyan-Type II Protosarada script, Toyuk, probably 8th-9th century , Ethnological Museum, Berlin. 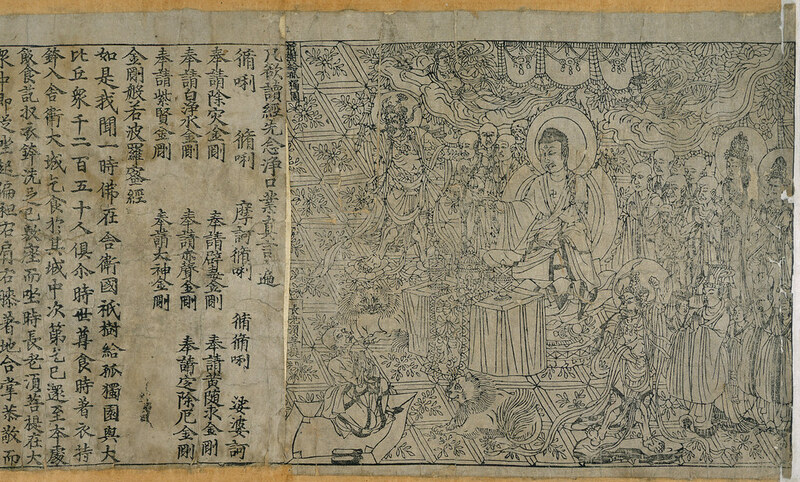 The image below is the frontispiece to the world’s earliest dated printed book, the Chinese translation of the Buddhist text of the ‘Diamond Sutra‘. This consists of a over 16 feet long scroll, made up of a long series of printed pages. It was printed in China in 868 A.D., it was found in the Dunhuang Caves in 1907 in China. Lotus Sutra, chapter on Expedient means,10th century,Japan. Folio from Ashtasahasrika Prajnaparamita manuscript ,Sanskrit (Ranjani Varendra Bhumi), palm leaf – 12th Century, Eastern India, Indian Museum, Kolkata. Title-page,Kangyur (Buddhist canon), 12th-17th century,Tibet,LACMA, USA. Below is depicted a the first leaf from a Prajnaparamita or perfection of wisdom manuscript. The text is in Tibetan language and script, a translation of a Sanskrit text that was produced in India a 1000 years earlier. The Buddha Shakyamuni is depicted on the left;on the night of his enlightenment at Bodhgaya. The tree under which he was enlightened appears above the temple. The goddess depicted at the right is Prajnaparamita, a personification of the text. Tibetan Buddha Shakyamuni and Prajnaparamita ,ink and paint on paper,13th century, Walters Museum, USA. Partial manuscript on metal plates with ornamented wooden covers, Pagan Kingdom, 11th-13th century, National Gallery for Foreign Art. Amitabha Sutra in book form. This entry was posted in asian art, Buddha, Buddhist art, Buddhist texts, Sutras and tagged Buddha, Buddhist texts, sutra on April 1, 2017 by historyreads.